Back row (left-to-right): Abhilash Patel, Syed Rafiullah, Javed Qureshi, Mahmood Ahmed, Vincent Correia, Vishan de Mel, David Mohammed, Brian Rajadurai, Shantha Jayasekera, Puvendrun Ravishankar Front row (left-to-right): Rudi Gibson, Rohan Jayasekera, Farooq Kirmani (Player/coach), Talal Iqbal (Captain), Asad Khan (Vice-captain) and Roy Singh. 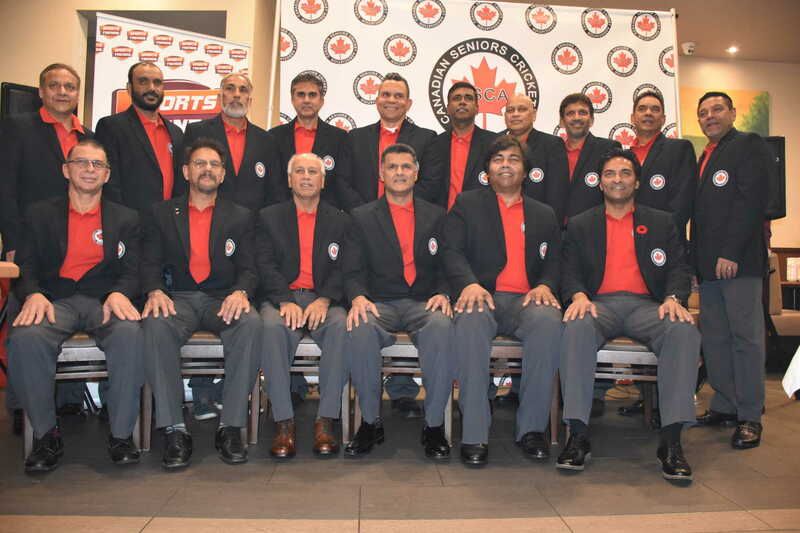 A celebration event took place at Karahi Point restaurant in north-west Toronto on Friday night (November 9, 2018) to mark Canada’s participation in the inaugural Over-50’s Cricket World Cup. Canada is one of eight participating countries. The tournament begins on Wednesday November 21, 2018 in and around Sydney, New South Wales, Australia. Games will be played to a maximum of 45 overs per innings with a maximum of 9 overs allowed for each bowler. Each team will comprise 12 players, one of whom will be designated not to bat. One of the speakers on Friday night hit the ball with the meat of the bat in saying “Canada was in the top ten of world cricket”. A reference to Canada qualifying for the second Cricket World Cup (the Prudential Cup ‘79 as it was then known) in England in 1979. There had been no qualification process for the first Cricket World Cup. Two teams without test playing status were selected to play in the inaugural CWC . Sri Lanka was one of the two nominated for the inaugural World Cup then qualified together with Canada via the 1979 ICC Trophy. Sri Lanka went on to win the 1979 ICC Trophy with a win against Canada in the Final. South Africa was suspended from playing international cricket in the early Cricket World Cups before being re-instated following the breaking down of the apartheid system. Fast forward to November 2018 when the inaugural Over-50’s Cricket World Cup will soon be starting at grounds around Sydney, NSW. Canada will compete against host Australia, England, New Zealand, Pakistan, South Africa, Sri Lanka and Wales in the round-robin phase. So the oft silent “Wales” portion of the England and Wales Cricket Board – where stands Wales when the board’s title is reduced to “ECB” – will be an independent participant. Glamorgan has carried the Welsh flag at the first class level in county cricket for many years and hosted international matches in more recent times. No “W” for Wales and no “W”, as yet no ODI Cricket World Cup championship for this version of the “ECB”. Perhaps St George and the Dragon should become better friends or else the Emirates Cricket Board version of “ECB” may capture the ODI CWC before the England and Wales “ECB”? 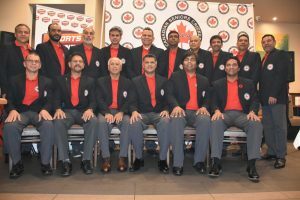 The Canadian Seniors Cricket Association was formed in recent years and during 2017 organized some tours to Pakistan and Barbados. Some of Canada’s squad still play domestic cricket but, unlike most of the other squads, the new Association saw a lack of over-50’s or “veterans” cricket (as it is called in Australia) opportunities to play in Canada. Canada is hoping to impress at this World Cup, just as Canada’s 1979 squad did well to qualify for the World Cup via the ICC Trophy. Canada’s first game is against Australia at the Drummoyne Oval (Drummoyne) on November 21. Next day Canada re-visit the 1979 ICC Trophy Final with a game against Sri Lanka at Pennant Hills Oval (Pennant Hills). On November 25 Canada takes on New Zealand at the Rosedale Oval (Warwick Farm) then plays England at the Alan Border Oval (Mosman) on November 26. The next challenge for Canada is against South Africa at the Old Kings Oval (Parramatta) on November 28, followed by Pakistan on November 29 at Benson’s Lane (Richmond). Canada’s round-robin play concludes with a game against Wales on December 2 at Raby Oval (Campbelltown). The top four in the Round Robin advance to the World Cup semi-finals. The team placed 1st plays the 4th placed team on December 3 while the 2nd placed team faces the 3rd placed team that same day. The lower four teams compete in the Plate Competition that also begins on December 3, 2018. The 5th placed team from the round-robin goes up against the 8th placed team while the 6th and 7th teams go head-to-head. The Plate Final is scheduled for December 5, then the Grand Final to determine the first Over- 50s Cricket World Cup Champions is to be played on December 6. Our best wishes go with the Canadian squad who will fly out to Sydney on November 17. A future article will outline Canada’s management, support and playing squad.